This week I wanted to focus on accessioning archives and the processes involved. When a collection has been offered to an archive, a lot of thought, care and attention are required. Archives need a lot of attention which is why, once a week, I hug the archives. Yes, you did read that right, and it’s not as daft as it sounds!! 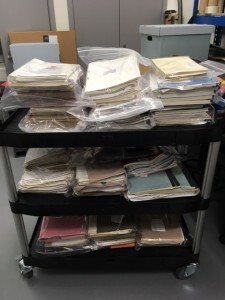 Before any material enters the archive store, it has to go through quarantine. 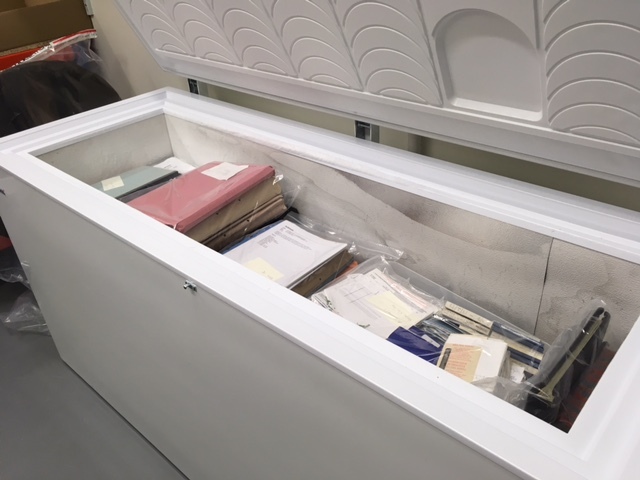 For us, that means we have to bag the archives into freezer bags, get all the air out and then put them in the freezer which freezes the archives to -40 degrees. Now the best way that I’ve found to get all the air out of the bags is to hug them! See, not so daft after all. This is to make sure any beasties don’t have any air to survive should they survive freezing. 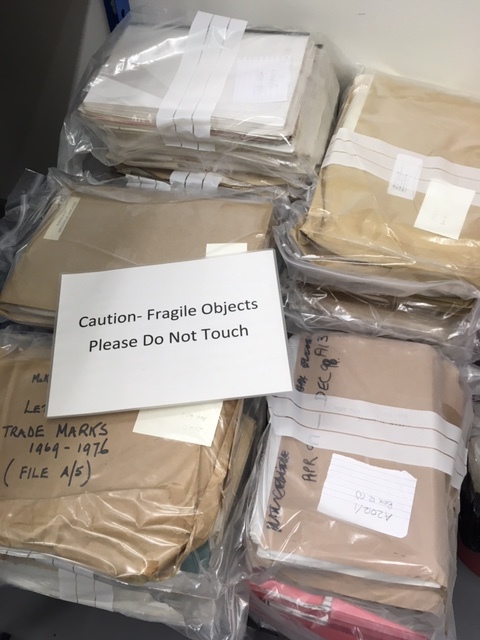 Once the material has been frozen, it is left to acclimatise before being put back into boxes and into our store. As well as hugging archives, we have been very busy putting together a small Christmas and New Year display for the festive season until the Old New Year – 12th January. 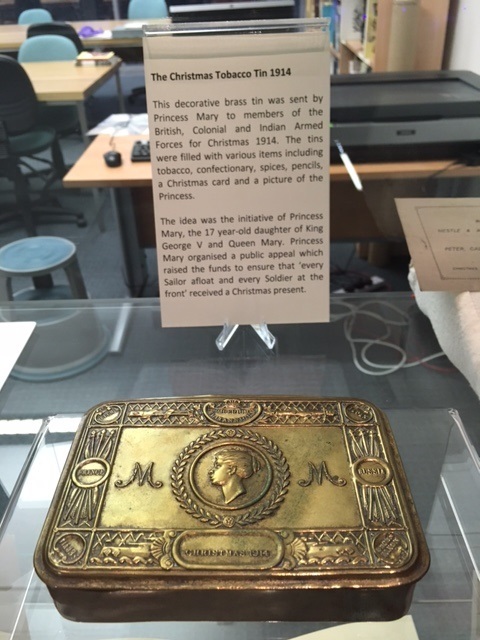 Thanks to our museum friends we have a few interesting items for our display. 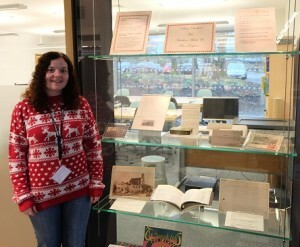 The Kenneth MacLeod collection includes a Christmas tobacco tin from 1914, and some other fascinating objects. Kenneth MacLeod was born on 14 February 1894 in Garenin, Lewis. He was known as ‘Coinneach Fox’. During WW1, he served with the Royal Naval Reserve on HMS Victorian which was an armed merchant cruiser. 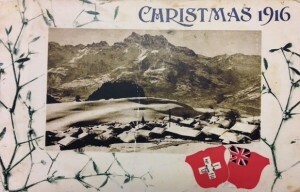 After being captured, he ended up in an internment camp in Murren, Switzerland due to illness. He later became a minister in the Church of Scotland, Nigg Chapel Hill and retired to Tain. 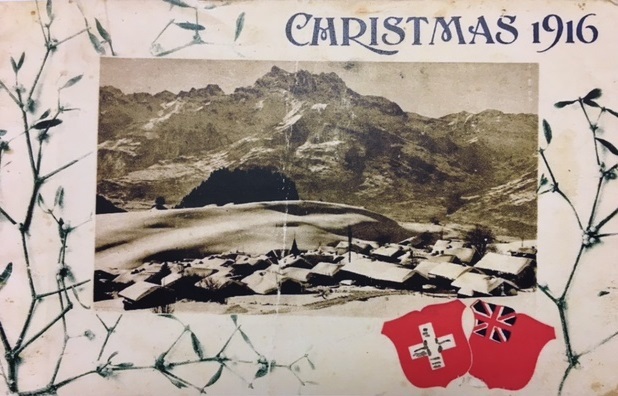 The collection includes a booklet given to the soldiers by Nestlé and the Anglo Swiss Condensed Milk company for Christmas 1916, exactly 100 years ago. Inside there are scenes of the soldiers who were interred as Prisoners of War in Switzerland. A number of postcards are also in the collection. This one shows Kenneth MacLeod sitting on the floor in a seaman’s uniform. Kenneth MacLeod’s Christmas photo postcard from 1916. He is seated in the middle of the front row behind the man lying down. 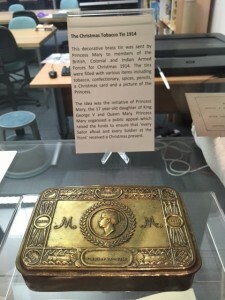 The decorative brass tin was sent by Princess Mary to members of the British, Colonial and Indian Armed Forces for Christmas 1914. The tins were filled with various items including tobacco, confectionery, spices, pencils, a Christmas card and a picture of the Princess. The idea was the initiative of Princess Mary, the 17 year-old daughter of King George V and Queen Mary. 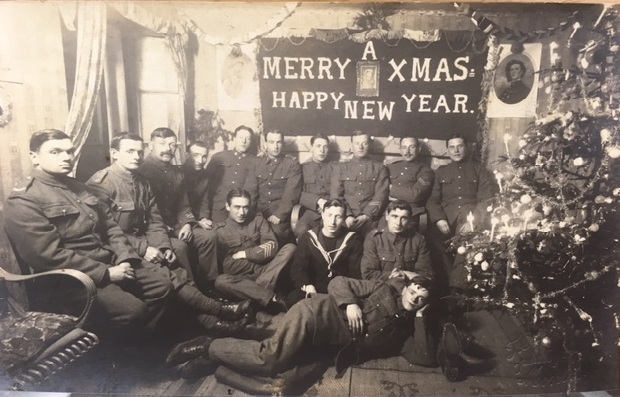 Princess Mary organised a public appeal which raised the funds to ensure that ‘every Sailor afloat and every Soldier at the front’ received a Christmas present. 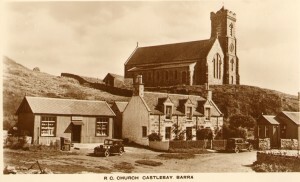 We have also included a picture Our Lady Star of the Sea Church, Castlebay, which opened on Christmas Eve 1888. Traditionally, however, New Year was the more important winter celebration. 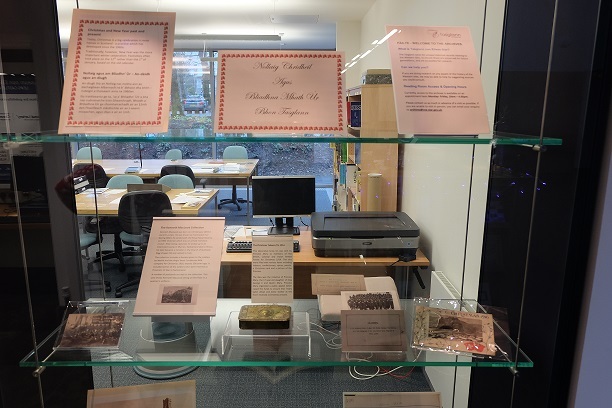 Festivities often took place on the 12th rather than the 1st of January, based on the old calendar which is why our exhibition will disappear after this date. If you are visiting Lews Castle or museum, pop by and take a look while it is still here. 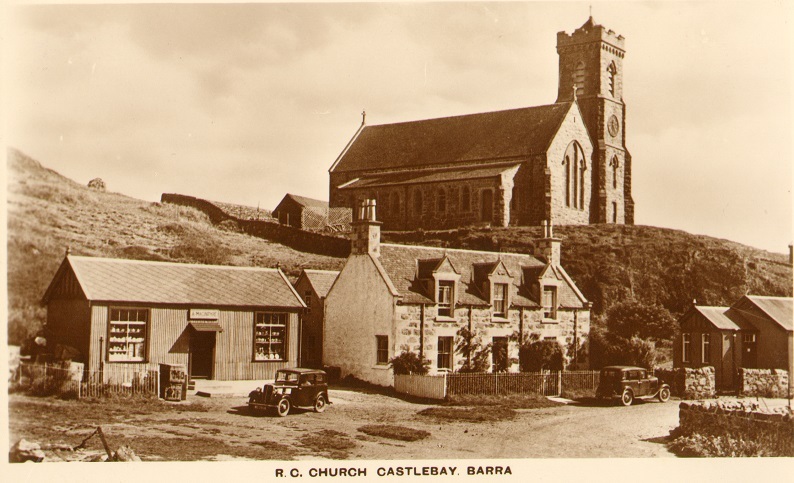 This entry was posted in Uncategorized and tagged Barra, Christmas, Happy New Year, Postcards, WWI. Bookmark the permalink.